The month of March usually means a spring break for kids, and parents. I was floored when a parent told me they were spending $1,000 for their kid to go to a specialty camp for the week. One thousand dollars. Wow. 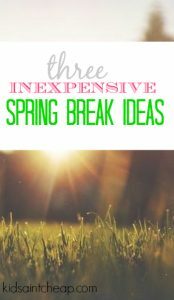 We’re three years away from our first spring break but with prices like that I’ll need to start saving now if we want her to do anything! Neither my husband nor I have the ability to easily step away from our job so when spring break does happen we may be able to take a day or two but I already know we will need to get creative with what we do with our daughter for the week. Luckily we have a lot of amazing friends and family who we can enlist to help! If you don’t have an army of people to call upon, there are still plenty of things to do that doesn’t include a $10,000 trip out of town and contending with massive crowds. I admit that growing up I thought museums were boring. I don’t live in a huge city but we have a few small museums that cater to kids during spring break. Most often you can spend entire days there doing day camps, for free. The most expensive camp I could find was $10 for the day per child and this included a lunch and supplies for the day, totally reasonable. Look around at different museums and see if they offer anything special during spring break and what the details are (sometimes drop off isn’t allowed and you need to provide supervision sort-of-thing). I have a memory during one of my spring breaks growing up with a day spent with my babysitter. She came over for the day and told my sister and I that we were having a movie day since it was pouring rain out. We built a massive fort with blankets, pillows and couch cushions, all hung out and watched movies and ate popcorn. It was simple and cheap! Plan a fun day at home depending on your kid’s ages and interests. Obviously if the weather is nice, getting outside is always enjoyable. Though kids may be reluctant to go anywhere near a book during their spring break, libraries, like museums often have fun activities going on. I know our local library has everything from a ‘’meet the princess day’’ for toddlers to a computer programing class for older kids. Classes fill up fast so check them out early. As a parent, the thought of spending a week pushing through busy crowds somewhere like Disney World does not appeal to me at all. I’d rather save my travel budget for different (and cheaper) time of year and enjoy a quite spring break at home!